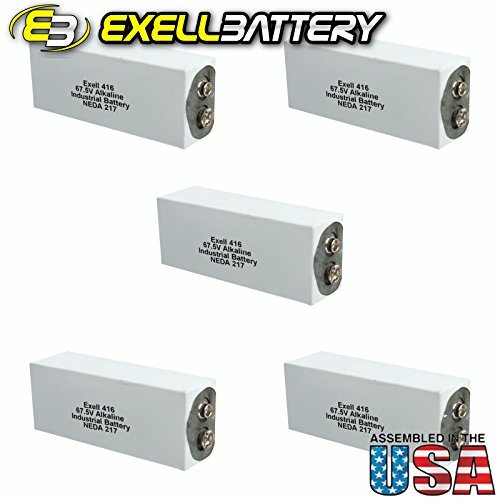 5x Exell 416A 67.5V Alkaline Battery NEDA 217 Eveready 416 Replacement Exell Batteries not only provide consumers with high efficiency, long-lasting performance, they also function as replacement batteries for an array of common and unique applications. Ranging from vintage camera equipment to sophisticated medical testing equipment, Exell Batteries can meet the needs of all consumers.The 416A (Eveready 416 or NEDA 217) is an Alkaline replacement for the once-popular Carbon Zinc battery that was commonly used in AVO meters. Being Alkaline, the 416A replacement will last longer than the original. It is widely used in vintage collectible transistor radios and in the early model 8 AVO meters, such as the Mk III AVO meter.Specifications:Type: AlkalineVoltage: 67.5VAmperage: 180mAhLength: 25 mmWidth: 33.7 mmHeight: 88.9 mmTerminals: Small SnapsAlso Known As: 217, 416, 416A, A416, ER-416SpecificationsBrand: Exell Output Voltage: 67.5V Amperage: 180mAh Chemistry: Alkaline Length: 25mm Height: 88.9mm Width: 33.7mm Country of Manufacture: U.S.A.